Our friend, Kerry Glen from New Zealand, has done it again!! 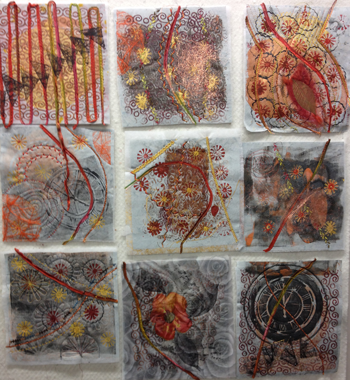 She took our Tilt A Whirl pattern to a new level by gelli plate printing 8" squares and setting them on a tilt. 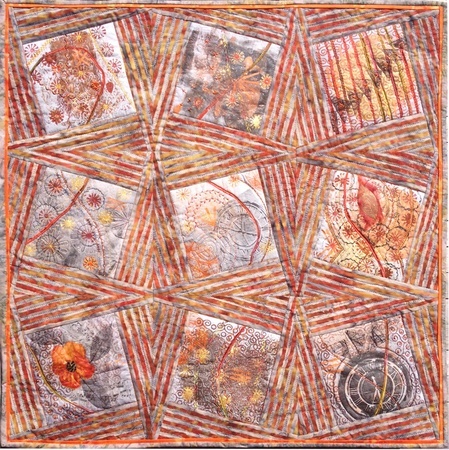 The fabric she used is a wonderful striped batik that sets off her color theme to a tee. Think of all the squares you could highlight in this fashion? Stamped blocks, painted blocks, embroidered blocks, fussy cut squares...what else? Keep in mind too there's a new addition, the Tilt A Whirl Variation pattern gives you just a little more to make your Tilt A Whirl just a little more dramatic!